2018 The case has gone quiet, with no further proposals or activity. A reason for this may be that Sainsbuy’s are no longer interested in locating a local store here. All the supermarket chains are winding back their development objectives for the present economic environment. 2017 After much dispute, minor changes to the car park and highway furnishing (ostensibly to make it safer for pedestrians), the plans were agreed by the CEC planning authority. October 2016 A new application has been submitted, but it is very similar to that previously rejected. Additional attention has been given to traffic calming and pedestrian crossings. The application is widely considered to be completely unacceptable. 13 January 2016 Application rejected! We await to see if the applicant either abandons the project, submits a better idea, or makes an appeal against the rejection. 23rd September 2015 A public meeting was held on Monday 21st September at Bollington Cross school. The purpose was to inform Bollington Town Councillors regarding the public’s opinions regarding the proposal so that BTC could determine its response to the application at its meeting on Tuesday 22nd September. No one could have been left in any doubt whatsoever that the public are not supportive of the proposed development. Almost all objections centred in one way or another around the traffic problems and the resulting dangers for pedestrians and road users. The Civic Society, while supporting the general tenor of objections, also objected on the grounds of the proposal to demolish the existing heritage building and replace it with one designed to have a passing resemblance. Something sinister in Bollington? – article in I Love Macc, written by Granville Sellars, proprietor of Brassingtons. Please note: The Happy Valley web site is not responsible for opinions expressed in other web sites. 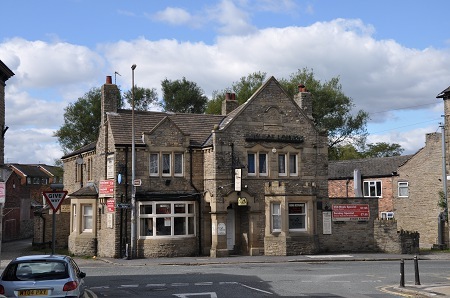 The owners of the old Waggon & Horses pub, which for more than ten years has been the Bayleaf Lounge and Indian restaurant, have submitted a planning application to demolish the entire building and to construct a new building, the ground floor of which would be let to J Sainsbury for use as a small supermarket, euphemistically referred to as a convenience store, the upper floor to be let to the present occupiers as an Indian restaurant. The new building would be situated a few metres to the right and a few metres further from the kerb than the existing building and provide a two lane access/egress between it and Barrow’s butchery next door. There would be a 13 place car park in the triangular space behind the building. Around 60 Bollington residents met at Bollington Cross school and noted their objections to the proposal. The following is a summary of the key points and is not an exhaustive list. There is huge concern regarding the highway implications of this proposal. Wellington Road Garage presently uses parking space behind the present Waggon & Horses building for temporary parking of customer’s vehicles. Loss of this facility may compromise the viability of this business. He announced that they had agreed to set the building back a further 0.5m at the request of CEC planners. The CEC Northern Area Planning Committee considered the application as submitted and alternatives could not be considered. However, the committee could provide conditions to a permission to develop. This leads one to consider what conditions might be put forward. Further alternative have been suggested but these could not be considered by the Planning committee under the present application. Objectors have a Facebook page – https://www.facebook.com/groups/bollingtonsainsburysproposal .